The Minimate Multiverse user Onyx_6 posted about how he upgraded his Iron Man Mark 50 Minimate from Infinity War, and I loved it so much that I decided to copy his recipe and post some instructions and photos here. 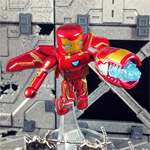 You will need A Funko Pop figure of this same armor, along with a hobby knife, superglue, and possibly a drill. Click the Read More button below to see the full post and instructions. 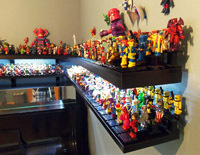 I put a lot of thought into how I wanted to display my Minimates collection. I didn't want it to take up too much space, and I wanted to see all of the characters - even the ones in the back of the collection. I also wanted it to be versatile and customizable. I came up with a tiered display system that is completely made up of Legos. This has been my set-up for over 6 years now, and I still love it. I have gotten a lot of requests over the years on the specific configuration and Legos used. This post will give you detailed instructions on building this tiered display system, and will offer some tips on other modifications you could make. Click the Read More link below to see the instructions and images.